Tiger Woods’ adorable daughter, Sam Alexis was seen out for a walk with mom, Elin (in black) and aunt Josefin (in grey) this morning in Sweden. It must be cold there because they have her all bundled up. 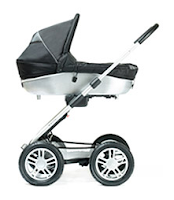 She rides in the ultra chic Mutsy ‘Urban Rider Next’ stroller. We haven’t seen Sam since she made a surprise appearance at the PGA Championship in August. The baby is being carried by her Aunt, Elin’s identical twin in this picture. It is very hard to tell them apart.